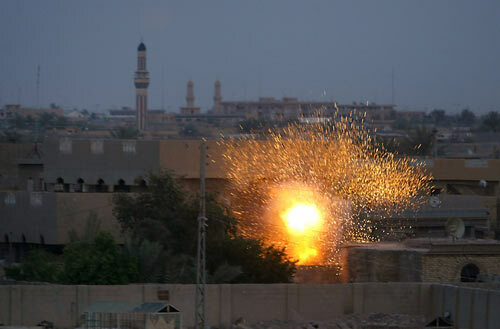 The explosion of an AT-4 rocket fired by U.S. forces onto the position of an Iraqi gunman brightens the scene as evening creeps over Fallujah. U.S. Marines cordoned off the city to battle insurgents following the grisly murders of 4 U.S. contractors. The highly-publicized deaths of four U.S. contractors in Fallouja prompted action by the U.S. military to quell the city's growing insurgency. Considered one of the most dangerous places in Iraq for U.S. forces, lawlessness abounds and anti-American sentiment is extraordinary. Marines charged into the city of 350,000 waging house-to-house battles as they sought to crush the insurgency. Several were killed and wounded trying to defeat a determined Iraqi resistance force.